What Is White Balance, and How Does It Affect Your Photos? Anyone with a digital camera has been there at some point: You take a photo, you check it later, and the color are ghastly–the people are sickly looking, white shirts look blue-ish, and the image just looks unappealing. White balance can fix this. Understanding camera white balance is a cornerstone of taking good photos with a digital camera. Poor white balance means, at worst, a ruined photo, and, at best, a lot of time wasted post processing your image in an attempt to fix what you could have fixed in-camera. By understanding what white balance is and how to use it properly, you will save yourself from disappointing photos and unnecessary work fixing them. Today’s tutorial will walk you through what white balance even is, how you can adjust it in-camera (and why you would want to), and highlight the dangers of bad white balance adjustment with sample photos. What Exactly Is White Balance? There are two principle things you need to understand to see the importance of proper white balancing. The first is that light has what is known as a color temperature. 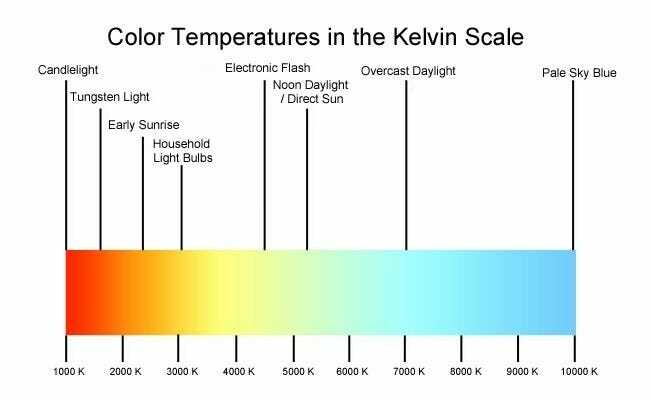 Now, what’s interesting about the color scale is, although we are aware of it (and can easily tell the difference between the warmth of candle light and the coolness of a hospital operating room lamp), we’re also masters at overriding it. Human vision is a marvel of adaptation, and among the many fascinating qualities our eyes and visual processing centers have is the ability to constantly correct what we see on the fly. One of the effects of this in-brain correcting is that we can identify white accurately under a wide variety of conditions. Whether someone is wearing a white shirt in the stark light of an office building, standing in the rays of the setting sun, or sitting at a table by candlelight, our brain does a marvelous job calibrating itself to the scene before us and the white shirt remains white. Digital cameras, however, do not have this sort of auto-magic color correction. The camera has to use algorithms to perform a best-guess attempt at identifying the neutral tones in the photo (the whites, grays, and blacks) and then calibrate the rest of the image to the temperature of the neutral colors. This is, as you can imagine, no small feat of engineering to pull off perfectly. Advances in technology and image processing have definitely improved the ability of modern digital cameras to do a good job detecting what the white/neutral tones should be in a given scene, but more often than not the camera falls short. Relying on the camera to automatically calibrate itself works well enough most of the time to lure you into a false sense of security, only to have you review your photos one evening and find the people in your photos are unnaturally ruddy or display the sort of blueish pallor best suited for vampires. A good way to think about the automatic white balance features in your camera is to view it like the grammar checking tools in modern word processors. Your word processor doesn’t really understand the English language the way a human would, just like the digital processor in a camera doesn’t really understand light the way a human would. Just like the grammar checker makes a best guess “OK, I’m pretty sure this is a comma splice…” and throws a green line under the error, the camera says “OK, I’m pretty sure this conditions of the photo are X, so I’m going to adjust the color tones to Y.” You should approach the camera’s ability to do automatic white balancing and color correction with the same attitude you approach the often erroneous grammar checker. Most digital cameras, even many smartphone cameras, have the ability to change the white balance manually. On lower end cameras and smartphones, this functionality might be limited to very simple selections such as Automatic, Indoors, and Outdoors, but on higher end cameras the functionality is generally extended to include a wide variety of pre-calibrated lighting conditions as well as the ability to set a custom white balance based on the current lighting conditions. For the purposes of this tutorial, we’ll be using a fairly common mid-level DSLR, the Nikon D3100, but the tips and tricks apply to any camera capable of changing the white balance settings and/or setting a custom white balance. Typically, you cannot change the white balance settings when the camera is in full-auto mode (as having to fiddle with the white balance would effectively defeat the whole purpose of shooting in full-auto mode). If you want to play around with your camera at home, you’ll likely need to switch to one of the other shooting modes like Aperture Priority, Shutter Priority, or Manual. Here, we can select one of the preset white balance options based on our current shooting conditions (e.g. are we shooting inside under incandescent light bulbs? Are we shooting in direct sun? Is it a sunny day but we’re in the shade of a building?). We can actually use these presets to recreate the effects of white balance gone wrong. First, let’s take a reference photo with the camera on automatic white balance. We’ve set up a white card and our trusty photography assistant Spawn out in the garden on a weathered bench, framed against a backdrop of green hosta leaves and an old fence–with the goal of this arrangement to show the white as a true reference point and the rest of the photo to show how a shifting white balance can really affect the overall color balance of your photos. Even with that large of a white reference area, it still didn’t quite nail it. This photo isn’t awful, but the automatic white balance is a tad on the warm side. 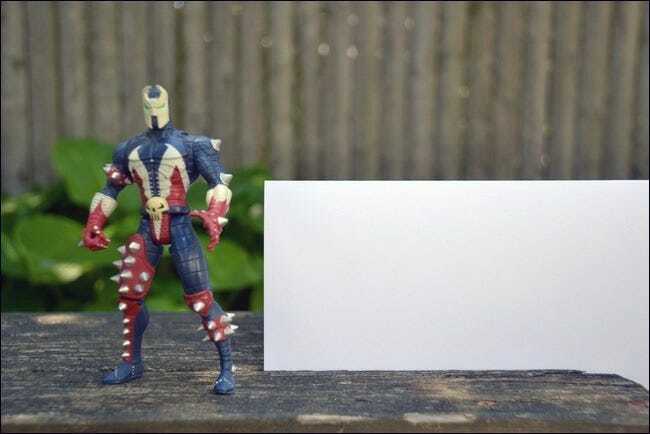 The white card is a little yellow, the gray and cream elements of the Spawn action figure are a bit on the yellow side, and the wood and plants in the photo have a bit of a greenish-yellow cast. Before we delve into correcting the slight color imbalance in the above photo, let’s look at how terribly wrong things can go when the automatic white balance fails you or you’ve set the wrong setting (we’re manually setting an incorrect setting here to simulate the kind of white-balance-gone-bad that typically happens as you change shooting conditions or turn your flash off and the camera hiccups and doesn’t readjust itself for the change). When the white balance is off severely, you will end up with photos that have an extreme yellow/red tint or blue/green. Each new selection of a preset white balance moves us further or closer away from the white card actually being pure white, but ultimately none of them (including the automatic white balance) are perfect. The best way to get a perfect white balance for the scene you are shooting is to set a custom white balance for the conditions under which you’re shooting. 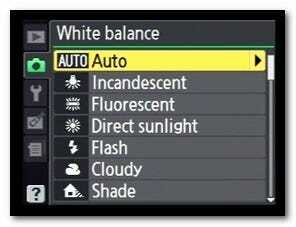 At the bottom of the white balance selection menu in the D3100, for example, is an entry for a custom white balance. In order to set the custom white balance you need to take a full frame shot of either a white card or an 18% gray card. 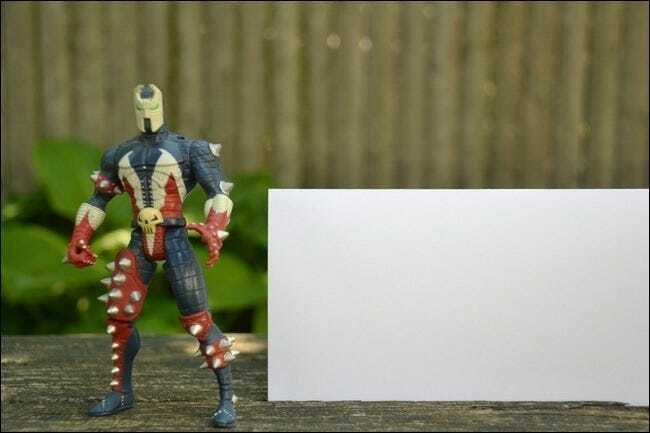 If you don’t have an actual photographic white/gray card, a piece of bright white card stock is a more than budget-friendly substitute in most situations. Of all the photos we took, this photo most accurately recreates the colors as present in the actual scene. Spawn’s facemask is a slight cream color, the light striping on his body is more of a grayish white, the white card is white, and the weathering/growth on the old wood bench has a blackish/blue cast instead of green. By forcing the camera to calibrate the white balance directly off a full-frame white card we were able to finally achieve a perfectly neutral color balance. Now, this brings us to a very critical point. The above photograph has a perfectly neutral color balance… which may not be what you want. Years ago, I had a Sony digital camera, for example, that shot a tad on the warm side even with an adjusted white balance. I knew that the camera wasn’t shooting perfectly neutral colors but I was OK with that because I loved how warm the photos I took with it were–portraits looked lovely and flowers and landscapes looked so warm and inviting. The point of this tutorial was to make you aware of how white balance affects your photos and to show you how to control it–specifically with the intent to help you avoid getting stuck with weirdly tinted photos, unable to figure out why and how to fix it. Armed with an understanding of color temperature and how to adjust the white balance to manipulate it, you absolutely do not have to aim for every photograph to be perfectly color balanced with a neutral white balance. Use your new phone white-balance manipulating powers to warm and cool photos as you see fit. There are many situations, like capturing the warm intimacy of a candlelit scene, where you won’t want to balance the color so perfectly the light becomes neutral. You may wish to dial down the warmth of the light, but to still keep the hint of the beautiful low-temperature scale yellows and reds the candle light provides. Have a photography tip to share? Have a speedy white balance workflow that will save your fellow readers time and frustration? Share the wealth by joining in the discussion below.